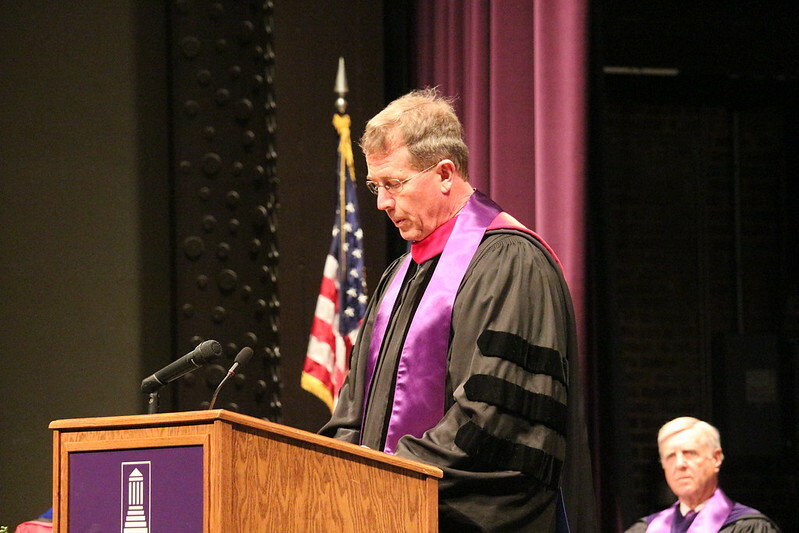 Seeing and nurturing the beauty inside of others was Bradley J. Andrews’ message to faculty, students and alumni of Southwestern College, as he was inaugurated as the Winfield, Kansas, school’s 19th president on April 14. “I propose that the greatest gift in the world – the single greatest gift in the world – is the ability to find the beauty inside of others and inspire them accordingly,” Andrews said during his inauguration address. The inauguration of Andrews -- a 49-year-old Miami native who rose through the ranks at Carthage College in Kenosha, Wisconsin – was a part of Southwestern’s Founders Weekend celebration. Finding beauty is not an easy task, he conceded. “It is quite difficult to see the beauty inside of those we disagree with; those we oppose in our most strident voice; those who would deny us what we desire or cherish; those who are fighting against what we are busy fighting for,” he said. Southwestern is one of four United Methodist-supported college in the Great Plains Conference. Among those with on-stage welcomes to Andrews was Great Plains Bishop Scott J. Jones. “You have come to a place that is already doing it better than most,” Jones said of United Methodist-themed service and education. At Carthage, a private liberal arts college affiliated with the Evangelical Lutheran Church in America, Andrews began as associate dean of students in 1999 and progressed to dean of students, vice president for enrollment and student life, senior vice president for academic resources, senior vice president of institutional advancement and, most recently, senior vice president for stragetic enrollment and student success.